Acupuncture is one of the therapies that are used in the practice of Oriental Medicine. It consists of the insertion of fine needles into the body at specific points for the treatment of specific health problems. These acupuncture points have been located by Chinese physicians over a period of thousands of years, and modern research has confirmed the locations of these points. Acupuncture is painless and safe, with no side effects. The needles used are very fine and hair-like. Only sterile, disposable needles are used. For children or patients who have a problem with needles, other methods such as acupressure are used. Acupuncture helps the human body deal with pain and illness naturally. It does so by stimulating the body to release its own natural painkillers (endorphins) and by improving circulation to areas that need to be healed. 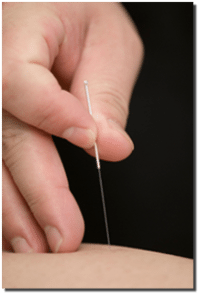 Other effects of acupuncture are to control hormones, strengthen immune function, reduce stress and emotional trauma, and restore balance and harmony. This entry was posted in Acupuncture, Oriental Medicine and tagged Acupuncture, oriental medicine. Bookmark the permalink.